The typical acidity of Barbera gives life to a perfectly balanced raisin wine, sweet but not cloying. Production area: Town of San Marzano Oliveto, typical area of production of D.O.C.G. wines. Vineyards: Given the particular over ripening of the grapes, the best rows of the vineyard of Barbera d’Asti Lia Vì are chosen from time to time. Working techniques in the vineyards: Pruning leaving 6/7buds. Activities in the vineyard are guided by a modern Biodynamic method, they are certified organic by “Suolo e Salute”. Manual grass mowing. Besides the regular cut of the branch of the cluster in August, another cutting is made at the end of September and half October, as well as a leave reducing to favor the air circulation through the clusters. Harvesting: Manual harvesting with baskets, followed by analysis of maturation, generally in the fourth week of October. Shining red with light and discrete shades of orange. Ethereal aroma, full taste, structured and with scents of morello cherry. In spite of the relevant withering of the grapes used for this wine, the characteristic acidity of the Barbera grapes, gives us a balanced raisin wine, sweet but not cloying. The withering of the grapes in the vines follows until the end of October and then on mats in controlled thermal environment until January. Grapes then are softly pressed and go through a short period of maceration, followed by a slow and steady fermentation in small barrels on their third usage, until the complete consumption of the yeasts. The stabilization and the ageing of the wine come spontaneously and naturally, to keep such characteristic organoleptic aspects. The creation of “Sospiro di Vigna” is completely attributed to Luigi. It was missing a raisin wine in Carussin’s line, the research and the dedication that Carussin gives to Barbera have driven Luigi to start, in 1995, the first experiment of withering grapes. For three years the wine was not sold: since there were no details regarding the withering process of the Barbera grapes it was decided to postpone its commercialization. 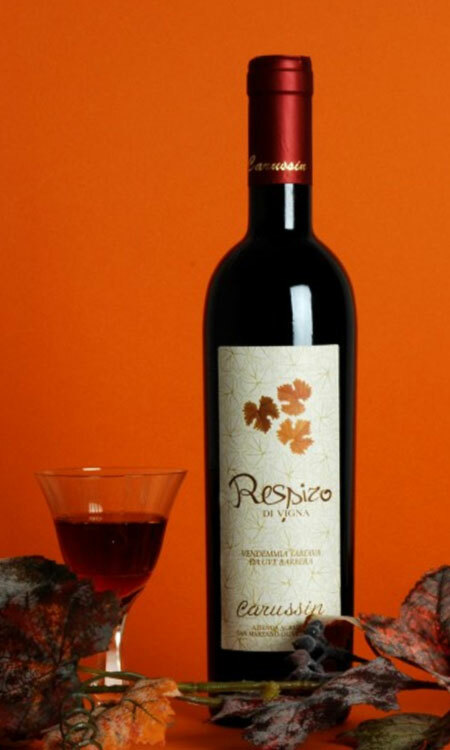 In 1998, a raisin wine “Respiro di Vigna” was launched, from 2013 onwards it was called “Sospiro di Vigna”. The vintages 2002, 2011 and 2013 were not made.